The day before the transit weather forecastings were not good. All the weathermen were speaking about clouds, storms and rain and this was not the worst thing. The worst was satellite images were supporting their claims!. Even so, the Meteosat image at 18:00 on monday, 7th, June started to suggest that maybe some holes could form over the north-west area of Spain next morning. 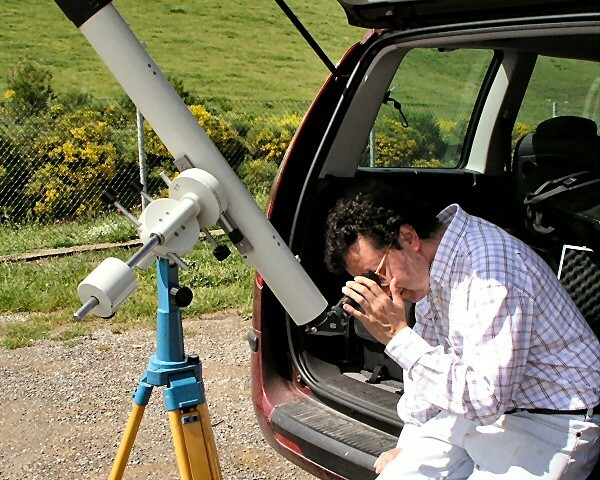 I spoke by phone to my buddy amateur astronomer Pepe Fernandez and he agreeded with me. His plans were based on getting up at 4:00 am local time, check the last meteorological news and if positive, go out towards "Aralla", a mountain about 70 kms south from Oviedo, at about 1,550 metres (about 5,085 feet) over sea level. He rang me by phone at 7:50 am from there, telling me the sky contained some clouds, but more than 80% of the sky was clean. From Aralla, he was also observing Sena de Luna, located about 300 metres lower and several kilometres away, being enterely enveloped in clouds banks. We arrived Aralla at 11:20 local time on the "Ulysses mobile Observatory" (see pictures), carrying a Zeiss Telementor, Baader "Sonnenfilterfolie" and also a video-camera mounted over a Manfrotto tripod and a suitable glass solar filter. Setting-up the instruments was a quick task and soon the eye was over the eyepiece, showing a really surprising big circular black shape over the sun. I have never observed a so sharply defined shape "on" the Sun, despite some years of solar observing. Never a set of spots had been so contrastly defined as the event I was observing. For taking pictures, I used an Olympus C5050 in afocal mode over the combination of a 35mm Eudiascopic plus 2x Celestron Ultima Barlow, yielding 48x. For visual, I used TV Naglers in 16mm, 9mm and 4.5mm focal lengths (due to their large apparent field of view, Naglers are very nice eyepieces while using a Telementor, because the mount has no motors and you must track manually). I used the 16mm (52x) and 9mm (93) eyepieces the more. Sadly, there was almost no sun spots, as if the Sun would have decided to remain inactive while the Venus show was on the stage. Even so, I clearly observed two formations not far from the center of our star and some faculae were also visible near the border and not far from Venus' position. However, I must say I didn't concentrate on solar features this time. 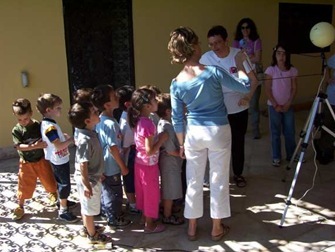 The video-camera proved invaluable. 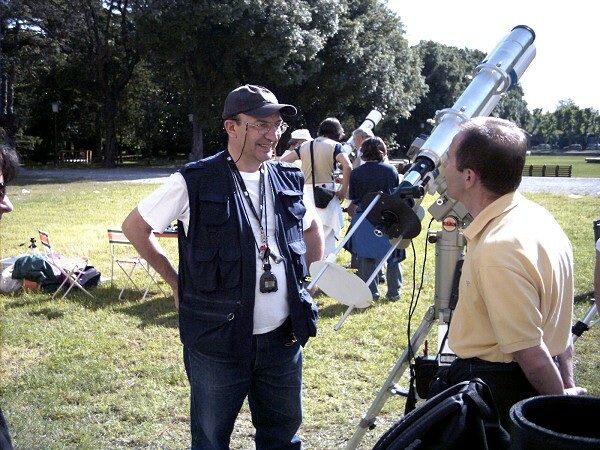 Back in August 1999 I had used it for the famous solar eclipse happening in Europe with a glass based sun-filter. At 20x it documents solar phenomena perfectly and it's also very well suited for Moon eclipses, being able to reach magnitude 5 stars (the video-camera is not new, in fact it doesn't use digital technology, but the Hi-8 system produces excellent quality). This time I videotaped some stages of the event, but not the egress, because at 20x it doesn't offer good resolution for knowing the time of contacts. My strategy for getting a good contacts timing was other: Just the day before, I synchronized the internal videocamera's clock with the clock that runs in my living-room. It's a digital clock that synchronizes every 24 hours via radio with an atomic clock located in Germany, so I estimate the videocamera is able to record events with a precision of +/- 0.5 seconds. After so many weather problems the day before, this transit has been unforgettable! Setup along the shore of "Bay de Noc" - Nikon Coolpix 990 camera. Note: "Noc" is a shortened form of "Noquet". The weather forecasts had bounced back and forth all week, from partly cloudy to thunderstorms; believe me I checked often. Because of this, I wanted to give myself enough time to find an alternate site if needed and so my adventure started at 3:00 am EDT. I checked the weather one last time before transit and satellite images showed clouds closing in from the northwest, diminishing any possibility of using my primary site near Munising overlooking Lake Superior. 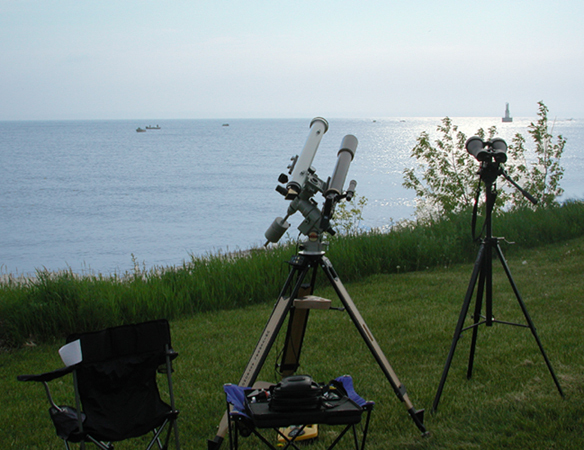 However, the skies just 50 miles to the south were clear and appeared to be out of the path of the front, so I headed out at about 3:30 EDT in search of a site along the Lake Michigan shoreline. I arrived in Escanaba Michigan just over an hour later and went down to the city park to check the available horizon. Escanaba juts out into Lake Michigan from the western shoreline and therefore the park had a clear view to the northeast across the waters of Bay de Noc. My trip had paid off. After a short trip for a bagel and a re-supply of caffeine, I began setting up a little after 5:00 EDT with the transit about 50 minutes away. I brought three instruments: a Zeiss Telementor 63/840mm with a 40mm Coronado h-alpha filter, a Zeiss AS 63/840mm with Herschel wedge and Celestron 11X80 binoculars with Baader Astrosolar film. 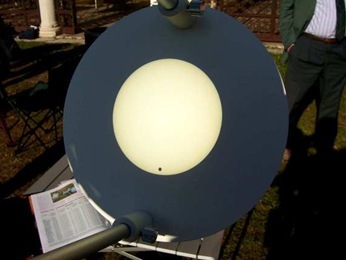 I had built the tube for the AS63 this winter with the idea of using it for the Venus transit. I felt that two scopes of the same aperture and focal length would provide good comparison images. 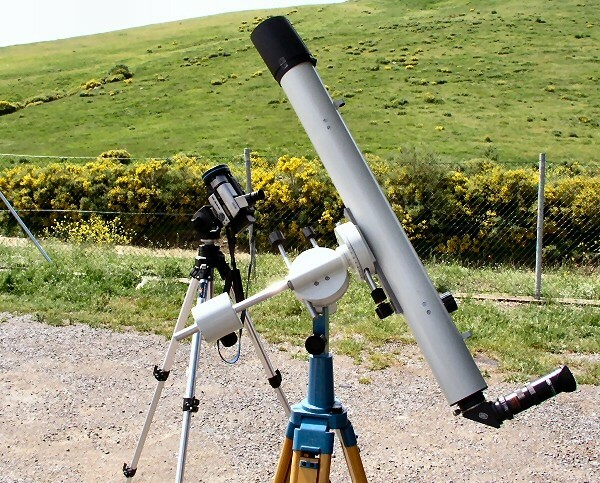 I mounted the refractors side-by-side on a Vixen GPDX mount and used a TeleVue 21mm plossl in each for 40X and equal full disk views. With dawn eliminating any trace of stars, I aligned the mount using a compass and this proved to be more than adequate for the low power view. The binoculars were placed on a Bogen 501 head atop a Davis & Sanford tripod. I also had made up a handheld solar filter from Baader film and cardboard. There was a thin line of clouds at the horizon (probably the clouds over Munising), but other than that the skies remained clear for the entire transit. The temperature was 60° F and there was a light breeze, really ideal conditions. At first I was alone, but by the time the transit had started, 4 individuals, who had heard about the event on the evening news the prior day, had joined me and we stood enjoying the early morning dawn in anticipation of something none of us had seen before. Because on the horizon clouds, the sun did not appear until about two minutes after predicted sunrise, about 5:57 EDT. I was able to see it clearly in both scopes as soon as the rim peaked into view, but the Baader film on the binoculars prevented viewing until the sun was more than half in view. That didn't matter though, because the real target lay on the lower half of the sun. When Venus first made it's appearance at about 6:01, I was awe struck. My first thought was that it was bigger than I thought it would be and next that someone had used the sun as a target and shot a hole through it. Those thoughts continued as the sun rose and changed shape from a somewhat flattened orange oval to a round yellow-white disk. The seeing was as expected at such a low altitude, not good, but I didn't really care - it was clear and I was there for the event. All of us took turns looking at the three views, trying to decide which was most appealing. There were many exclamations of delight at what we were seeing. 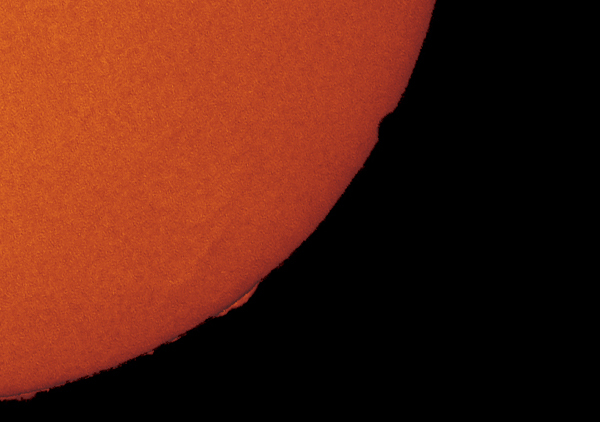 The sun was unusually quiet in h-alpha with very little surface detail and only a couple of tiny prominences barely rising from the limb. I'm sure if it had been active that this would have been everyone’s number one view, but now the small group of observers was mixed when it came to a favorite. I have to admit that I had a hard time deciding, but I usually stayed longer at the 11X80's. Maybe it was using both eyes or maybe the lower magnification or maybe the slow drift of a faint contrail across the sun that made the view so appealing, but it was mesmerizing. I tried a couple of times to image through the binoculars with a handheld camera, but was unsuccessful. We also took turns at using the handheld filter and trying to spot the planet, "naked eye". 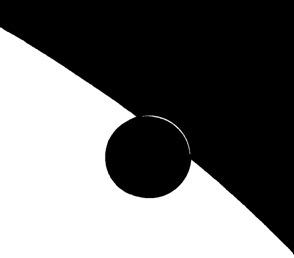 All of us were able to see a small speck of black on the "quarter-size" solar image. I waited till everyone had their fill of views before attaching the camera to a telescope. I was using a Nikon Coolpix 990 coupled to a William Optic's DCL28, which is a 24mm plossl and yielded 35X in each scope. I like this setup because I can easily moved it from scope to scope. I made a few images in both "lights", but fully expected that the seeing would not yield the desired results. I particularly wanted a shot each in h-alpha and "white light" as a keepsake. I took quite a few images, but seeing wrecked most. I ended up with two h-alpha images - one of the full disk and a close up near 4th contact and a few white light images centered around 3rd contact. Third contact was at 7:06 EDT and twenty minutes later Venus was gone, nearly 90 minutes of transit in all. It was a remarkable experience, one that will long be remembered and well worth every effort. Tired, I began to pack up with a smile on my face. I read the book for the first time 35 years before the 8 June 2004 transit, and it’s hard to speak about the thrilling atmosphere of the night before the transit, it resembled the night before the high-school examination. The weather forecast was fantastic, we were entering in a crystal clear day. 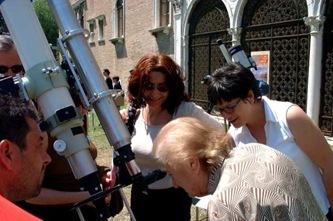 The observation was set up in Ravenna’s Public Garden, near local Planetarium, and was managed by the Planetarium itself and run by amateur astronomer of 2 clubs, ARAR (Associazione Ravennate Astrofili Rheyta) and ALPA (Associazione del Libero Pensiero Astronomico). We met at 5:30 in the morning to set up the telescopes and to check all the stuff. A bad vibration was around when the RA motor of Marco’s telescope broke down, and his stopwatch too … but the negative sequence stopped there. My personal setup was the Takahashi equipped with Herschel prism and the Telementor with Baader Astrosolar filter. My only “work” was to take the timings of the internal contacts to send to ESO to collaborate for an amateur determination of Astronomical Unit. 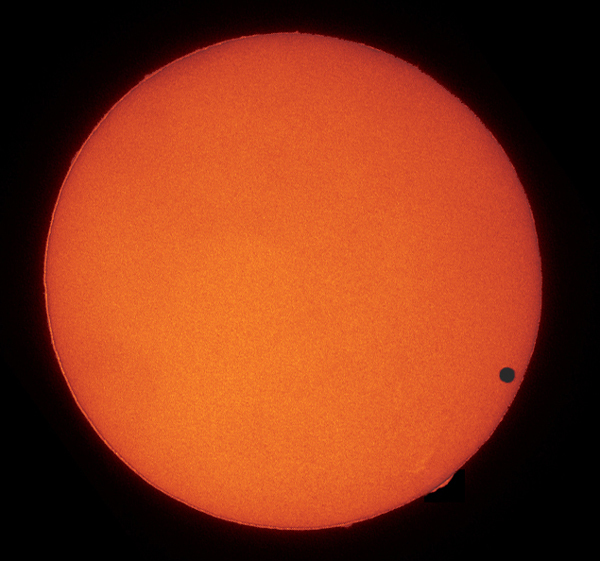 Waiting for the first internal contact I saw a thon arc of light surrounding a part of Venus’ disk out of the Sun. It was stunning, it was the effect of Venus’ atmosphere described by some astronomers the past, but I was sure it was a minimal phenomena, at limit of perception. On the contrary, it was a vision of rare evidence and sharpness. I spent the morning observing and hosting people at the telescope – many came to observe with there own eyes the rare event claimed by newspaper and TV news the day before. I had also a big number of eclipse and welding filters, and I was able, and many people with me, to check that the transit was visible without the telescope – there was a debate about in many astronomical newsgroups in the months before the transit. Under some columns in the near complex of Museum “Loggetta Lombardesca” there was a video projector showing the images of transit get by a web cam at the focus of the 4” Meade refractor. There was also a setup of panels and a model of Sun-Venus-Earth system showing the mechanic of transit. After the 3rd contact, I have observed again the arc of Venus’ atmosphere, visible both in the Takahashi than in the Telementor, and I as able to see it until the center of Venus’ disk was well out the solar limb. 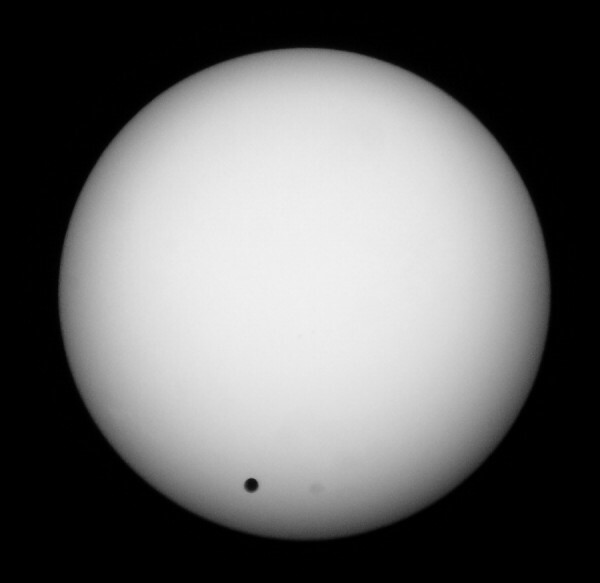 After the 4th contact, the transit was over, and the Sun disk was desperately and completely empty, the transit that nobody was able to see after 1882 had taken place … and finished. 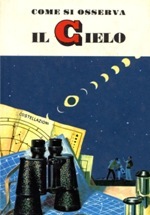 Of all public observations, this is was for sure the most fine and unique, I think it will remain in the memory not only of us amateur astronomers, but of the many hundred people that shared the observation with us.